As noted earlier on Proliferation Press, the CPWMD will be releasing Wednesday what appears to be a dreary look at the WMD proliferation threats facing our country and the world. In the backdrop of last week’s terrorists attacks in India and the likely role some commission members may play in the Obama administration, well-timed leaks to the NYTimes and Washington Post are promising the commission’s report some limelight from policy makers and journalists alike. A November 30th report in WaPo focused on the threat of biological attack. It highlights a serious gap in American’s security system: that many research labs equipped with dangerous biological materials evade federal regulation since they are private and hold pathogens not on the government watch-list of known biowarfare agents. According to the report, this means there are currently non-regulated labs holding the SARS virus—the virus used in a series of biological attacks in 2001, resulting in 5 deaths. Not to be left out, the NYTimes today released a report outlining the report’s executive summary. The Commission recites a typical litany of policy prescriptions: renewed efforts to curtail Iranian and North Korean nuclear programs; improved defenses against bioterrorism; and a new energy in multilateral approaches to containing the threat of WMD proliferation and terrorism—with particular focus on the International Atomic Energy Agency (IAEA). Yet what is most worrisome is the report’s dismal assessment of Congressional oversight in regards to WMD proliferation and terrorism. After seven years it appears the US Government has failed to lay out and comprehensive and peer-reviewed strategy for combating the gravest threats to American security. Having already ceded most of its war-powers authority, can Congress really afford to be as a impediment to prudent policies that aim to prevent another 9-11? Discussing/proposing an effective form of Congressional oversight over the gravest threats to American security, or simply pointing how ‘how’ the current Congressional oversight is dysfunctional. Is the key problem a lack of executive-congressional communication? Overlapping committees? Or is it simply a product of the White House running executive agencies, with Congress seen as too much a source of undesired leaks, partisan back-biting and echo-chamber discussion? A system of distinguishing the ‘must-have’ from the ‘wish-list’. Pointing out flaws in the current system is valuable, but only if tied to a frank discussion of American capabilities are and how to best use them toward preventing WMD proliferation and terrorism. For example, how can America work towards both a proliferation-safe Pakistan and the need to safeguard American laboratories with SARS; and let’s not forget the looming threat of a radiological device stored away in a commercial ship’s cargo going off while docked at an American port. The panel’s 13 recommendations focus on fighting the threat of bioterrorism, including improved bioforensic capabilities, and strengthening international organizations, like the International Atomic Energy Agency, to address the nuclear threat. It also calls for a comprehensive approach for dealing with Pakistan. Over all, the findings and recommendations seek to serve as a road map for the Obama administration. The commission urges the Obama administration to work to halt the Iranian and North Korean nuclear weapons programs, backing up any diplomatic initiatives with “the credible threat of direct action” — code for military action, a commission official said. Two weeks ago, the International Atomic Energy Agency reported that Iran had produced roughly enough nuclear material to make, with added purification, a single atom bomb. The commission also criticized the administration and Congress for not organizing themselves more effectively to combat the threat of unconventional weapons. The report recommended a single White House-level office or individual responsible for directing the nation’s policy to prevent the spread of unconventional weapons and their possible use by terrorists. Congressional WMD & Terrorism Commission: Upcoming Report; Gauge of Obama’s Future Policy? The congressionally-created Commission’s ambitious mission? To assess America’s anti-terrorism and WMD prevention strategies. With the mainstream-news fixated on presidential transition updates & economic woes, we’ll see how much press traction the Commission’s work achieves. But there’s a twist—which may just make this report a leading indicator the incoming Obama administration’s own WMD and terrorism policy priorities. Commission member Wendy R. Sherman, currently a senior partner of The Albright Group, now spearheads Obama’s policy review team for Department of State. Members include: Graham Allison, Robin Cleveland, Wendy Sherman, Henry Sokolski, Stephen Rademaker, Timothy Roemer and Rich Verma. Time Magazine teases out the practical and symbolic effects of the nuclear deal to India. Yes, they get can now receive more sensitive technologies—but the real impact is breaking the India-Pakistan ‘hyphen’. But—as Mother Jones notes—will the deal risk a break-down of global non-proliferation efforts? And Asia-One News tacks the deal’s winners and losers. But one thing India does not doubt is that the 123 Agreement will transform the way the country is viewed in the eyes of world. According to strategic affairs analyst Manoj Joshi, without access to international nuclear trade, India “could boast of our bomb, our BPO prowess, economic growth, invites to the G-8 meetings and candidacy for the UN Security Council seat. But we were firmly at a different level from, say, China. They could import powerful computers, uranium, sensitive machine tools, software and components for satellites that were denied to us.” Today, that changed, as did the international community’s policy of equating India and Pakistan as nuclear weapons states. As Indian and U.S. officials have repeatedly pointed out, the deal has “de-hyphenated” India from Pakistan. “For decades India has chafed at the world’s tendency to lock India into a bipolar South Asian framework with Pakistan,” says Joshi. “Now, decisively, the rules have been changed for India, and pointedly not for Pakistan.” The deal also has a bearing on the regional balance of power, making clear the U.S.’s proclivity to India and sending a signal to Beijing that it has other options in the Asian region. On a slower news day, the deal might have gotten more fanfare. But in Washington, immediately after voting, the Senate went back to deliberating the financial bailout package. The Bush administration had achieved one of its most important foreign affairs successes, but there was more pressing business to be sorted out at home. Secretary of State Condoleezza Rice is expected in India later this week to ink the agreement with Indian External Affairs Minister Pranab Mukherjee. In India, news channels interspersed images from the deal being passed with footage of Oct. 2 bomb blasts in the northeastern state of Tripura. Neither of the governments that led these historic efforts will benefit from it today. But for both, the deal will be a significant and unprecedented legacy. Business Standard reports on the liklihood of Pakistan–in clear reaction to the US-India nuclear deal–pushing for a nuclear deal with China. In its bid to offset the impact of Indo-US nuclear deal, Pakistani President Asif Ali Zardari will take up the acquisition of nuclear fuel technology from China during his forthcoming visit. The Pakistan government has decided to set up two nuclear power plants worth Rs 139 billion to overcome the country’s energy crisis, official sources were quoted as saying by the Aaj Kal Urdu daily. Zardari, who is expected to visit China in the near future, will discuss the acquisition of fuel technology for the two new plants with the Chinese leadership, the sources said. While one may consider India a prime candidate for nuclear commerce, many of its attributes–steady regime, peaceful political turnovers, even accepting terrorism probelms–Pakistan’s regimes have not shown themselves durable. While jockeying between weak deomcratic regimes and strong-man dictatorships, expanding Pakistan’s nuclear arsneal and power facilities comes with additional headaches: abrupt regime change and the real and potent presence of radical Islamic terror-groups. Time will shown if Pakistan’s newly elected President and re-charged (if unity-less) Paraliament can foster the stability, liberalism and security so lacking in Pakistan’s recent past. And–addressing worse-case scenarios–the Pakastani military has shown strong and responsible control over Pakistan’s nuclear hardware. But Pakistan’s four-pronged pressures–economic woes, Kashmir, periodic political upheaval and the worrisome presence & support of Islamic terrorism–keep international concern over this country at a high level. A solid interview with Michael Krepon, Co-founder, The Henry L. Stimson Center for the Council on Foreign Relations. The government of India has been very clear in saying that the suspension of fuel supplies at its power plants would be grounds for removing Indian facilities from the IAEA safeguards agreement. What this means is, quite simply, that in the event of a resumption of Indian testing, French and Russian suppliers of fuel will argue very strenuously that fuel supplies should continue because otherwise safeguards will be removed—and there will be no consensus in the NSG. So the clear legislative intent of the Congress has been subverted by the Bush administration’s dealings with both the IAEA and the NSG. Another interesting question is whether or not the government of Israel will seek exemptions from the typical rules of nuclear commerce, not necessarily for power plants, but perhaps for desalinization plants, that’s another possibility. I think the ramifications of an Israeli attempt to get exemptions from nuclear controls are worth considering. The interview succinctly shows the flaws with the nuclear pact, while fleshing out its the political and commercial consequences. The Wall Street Journal reports on the recent US Treasury decision to label Iran’s national shipping industry a ‘proliferator’. The move further tightens the screws on Iran, which while a large supplier of crude oil is dependent on other nation’s refiners to turn that oil into usable products—like gasoline. It’s an interesting episode of how international trading laws governing maritime commerce intersect with nuclear proliferation and raw realpolitik. The move isn’t all that unprecedented for the Bush administration: in 2005, several firms from China, India and Austria faced US Treasury sanctions for providing Iran with missile and chemical-arms related products. But this is the first time a nation’s shipping industry has faced such action: illustrating the Treasury Department’s evolving role in non-proliferation issues. Read Iran’s response to the news here. The U.S. Treasury Department accused Iran’s national maritime carrier of helping the country’s nuclear and missile programs, a formal move designed to pressure Iran amid stalled talks over its nuclear work. The Treasury, in designating the carrier as a “proliferator,” said the Islamic Republic of Iran Shipping Lines and 18 of its affiliated entities were secretly “providing logistical services” to Iran’s military, falsifying shipping documents and using deceptive terms to describe shipments in order to hide their activities from foreign maritime officials. The designation, which typically is designed to stop companies on the list from doing business in the U.S., further blocks the carrier’s ability to move money through U.S. banks as well as blocking it from carrying food and medical supplies not included in Washington’s longstanding trade sanctions against Iran. This is the first time Treasury has designated a shipping company as a proliferator, the department said. The company says it has a fleet of 91 ships, most of them bulk carriers designed to transport dry cargo such as grain, coal and iron ore. Oil shipments from Iran, one of the world’s biggest exporters, aren’t likely to be affected. The company says it has just two tankers, and they are used to transport vegetable oil and similar products. The move could complicate Islamic Republic of Iran Shipping Lines’s dealings with other countries. Its ships call frequently at nearby Dubai, part of the United Arab Emirates, according to the Iranian carrier’s Web site. The company also says it makes regular trips to big ports in Hong Kong, Singapore, the U.K., Germany and France. Containing the Nuclear Genie: Will Turkey Tap into Nuclear Power? Turkey’s recently empowered AKP majority government might just dust off as till now dormant plans for a nuclear power program. If Turkey takes this step, will nuclear weapons be an inevitable outcome in the future? No—but that depends a lot on Iran. And Turkey may follow Iran’s nuclear trajectory, developing its nuclear weapons capability by asserting its right to pursue nuclear energy technology. Recent power and water cuts led to intensified calls to consider nuclear energy as a solution out of the current crisis, as temperatures are predicted to keep rising resulting in longer and hotter summers for the country. The Turkish capital woke up to dry taps yesterday as a result of dramatic rises in temperatures that have dried up water reservoirs, while power cuts remained restricted to a few cities in western Turkey. A series of interruptions in energy supplies prompted both fears of regular blackout and debates over the government’s energy policy. The Turkish Daily News reports the country’s average appetite will be 190 billion kilowatt hours this year, up from 176 billion kwh last year, which was an 8.4-percent increase from 2005. Turkey’s energy minister says cuts to supply will be limited to a handful of areas, not mass cuts countrywide. We believe that states of the region should terminate their efforts for developing such weapons and their delivery means and, become party to the non-proliferation regimes and treaties as soon as possible. In this respect, the need for a WMD-free zone in the Middle East is of paramount importance. Turkey does not possess WMD and does not intend to have them in the future. Turkey adheres to all major international treaties, arrangements and regimes regarding non-proliferation of those weapons and their delivery means, and actively participates and supports all efforts pertaining to non-proliferation in the NATO. As it is known, Turkey is situated in a region having an inclination to the proliferation of WMD and their delivery means. Some of our neighbours, who are not parties to the regimes or organizations aiming at preventing the proliferation of WMD, are attempting to develop these weapons. These dangerous attempts are being observed closely and anxiously. Turkey—a member of NATO and strong US partner—is not now pursuing a nuclear weapons program. But this policy is based on a critical premise: that the Middle East remains nuclear free. While this region did not hit a tipping point with Israel ‘non-existent existent’ nuclear deterrent, Iran’s developing nuclear program risks setting off nuclear weapons proliferation throughout the region. And while a nuclear armed Middle East could bring Cold War era stability, this outcome comes with a grave risk: nuclear weapons entrusted to slippery hands. Fragile regimes + strong currents of radicalism + nuclear weapons = greater global security? Hailing a new foreign policy “based on hope, not fear” presidential candidate John Edwards merged a call for global justice with global security. His speech to the Council on Foreign Relations covered a host of issues: Russia, the rising states of India and China, America’s bureaucratic deficiencies, the folly of missile defense, and new strategies on educating and supporting the world’s poorest members. But at heart, Edwards sketched a strategy of containing the threat of international terrorism through a renewed moral and internationalist foreign policy. But Iraq, while addressed often in the speech’s opening, was noticeably absent latter on. Why? Because an Edwards presidency would see U.S. troops leave Iraq. Yet Edwards crept in an admission to his well-known pull-out insistence: his call for U.S. troops within the Green Zone and a Gulf force of unspecified size. The speech showcased a populist rift on liberal internationalism. What differed this speech from the usual liberal accord for returning to traditional alliances and multilateralism, were three aspects: 1) specific plans to educate and feed the world’s poor through a cabinet-level department, 2) elevating genocide-prevention to the same status as self-defense, and 3) an articulate discussion on how to refocus America’s defense strategy from a war to containment footing. Edwards laid out many specific proposals, including the creation of a rapid-action force to stabilize fragile states, a $5 billion increase in foreign aid, and synchronizing the national defense strategies of the State, Defense and Energy Departments. Edwards also called for giving room to non-Pentagon—which he sees as “on steroids”—in matters of national security. Building up and defending fragile states again and again became the main theme of the speech. Edwards spoke of a fence-sitting generation: a clear allusion to the battling raging between moderate and radical Muslim forces. “It’s America’s job to attract them to our side like a magnet,” Edwards stated without a using only the “hammer” of military power. But this did not stop Edwards from elevating the need for counter-proliferation efforts, especially in regards to Iran and North Korea. In fact, Edwards placed nonproliferation before fighting terrorism when it came to the uses of American military power. And instead of discussing how to hunt down terrorists, Edwards spoke more on how restore America’s legitimacy and respect: demanding the closure of Guantanamo, more engagement in NATO and the United Nations, and restoring habeas corpus/banning torture towards foreign terrorists. Throughout the speech Edwards slammed the Bush administration on every aspect of security. Edwards views Iraq as an insistence of “misuse and misdirect[ing] the extraordinary power America has.” Edwards criticized the administration’s conception of civilian rule over the military, pledging to keep “tactical” aspects of military operations in the hands of professional military staff. Edwards noted Bush’s support for missile defense, in particular, as a prime example of waste on unworkable policies. While Edwards bemoaned the Iraq monopoly on discussion of America’s foreign policy, one wonders how the many policies Edwards hope to pursue can overcome a possibly disastrous American pullout. What succeeded after WWII can succeed again, Edwards stated. Again and again Edwards returned General George Marshall and the tremendous impact of the Marshall plan in ending the Cold War. It was this economic assistance, in tandem with America’s alliances and—far less described—military capability that permitted America to win the Cold War. Whether or not this speech covered all the bases, one wonders if the power of example will solve a possible Iraq conflagration after a U.S. withdrawal—or for that matter a flawed escalation. (Granted, this flaw is shared by every presidential contender.) But by publicly presenting his view of a post-Bush U.S. foreign policy, Edwards has given the American public–and his opponents–a series of policies to contemplate, debate and respond to. Israel might just be showing the world how to live in a world of nuclear anarchy. Turgeman told The Jerusalem Post that the improvements to the missile not only reduced manufacturing costs – by some 20 percent – but also improved its ability to intercept incoming ballistic threats. The Arrow missile has proven its capabilities time after time,” Arieh Herzog, head of the Homa missile defense agency, said. “The Arrow protects Israel from all ballistic missiles in the region,” he said. Defense Minister Amir Peretz praised the successful launch, calling it “another stage” in the development of Israel’s missile defense system that provided protection against long-range threats to Israel. This success builds on past successes for Israel, one that reflects the profound worry over Iran’s perceived nuclear ambitions. And recent reports on Iran’s decision to limit cooperation with the IAEA have no doubt added to Israeli concerns. Here more information on Israel’s ARROW anti-missile system. Musharraf has faced stiff public resistance for removing Pakistan’s top national judge. And this public turmoil in Pakistan—a nuclear weapons state—coincides with deadly mudslides in Kashmir and its recent cruise-missile test. Is Musharraf’s fate sealed? And will this mean a severely troubled (or even failed) state in Pakistan—a country with an active nuclear weapons program? The second element is the country’s three intelligence agencies, which are at loggerheads over control of Musharraf, Pakistan’s foreign policy, its political process and the media. Military Intelligence and the Inter-Services Intelligence are military agencies, while the largest civilian agency, the Intelligence Bureau, is now run by a military officer. Ironically, Inter-Services Intelligence, the most powerful agency in the country, has been the moderate element urging Musharraf to open up the political system to the opposition parties. The other two agencies are the hard-liners and are urging Musharraf to adopt even tougher measures. The third loss for Musharraf has been the unqualified international support he has received since the Sept. 11, 2001, attacks. Anger in the U.S. Congress and media, and particularly among members of the Republican Party, toward Musharraf’s dual-track policy in Afghanistan — helping to catch al-Qaeda members but backing the Taliban — is making it difficult for President Bush to continue offering Musharraf his blanket support. Hard-line Islamists, favoured previously, are now out, and soldiers charged with mutiny have received the death penalty, says Hoodbhoy. 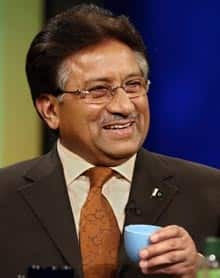 Although this has further deepened pro and anti-US divisions within the army, among both commissioned and non-commissioned officers, Musharraf clearly expects to remain the president well beyond the October 2007 elections, as well as extend further his term of leadership of the army. “To achieve this end, whatever needs to be done will be done; principles and rules are elastic,” Hoodbhoy says. He also writes that the US remains “clueless” on how to deal with Pakistan and its problems. “One might have expected the Americans to know better than to bet all on a man who might be gone tomorrow. But, beyond pumping in dollars and supporting Musharraf and his military, the US appears clueless in dealing with Pakistan and its problems of social development,” says Hoodbhoy. These developments will undoubtedly cause diplomatic heartburn from the United States. Whatever Musharraf’s faults, he kept Pakistan (relatively) stable and was a key ally (though imperfect) of the United States. Whatever is to come of Musharraf, unpredictability in Pakistan’s politics carries with it profound ramifications in global security.